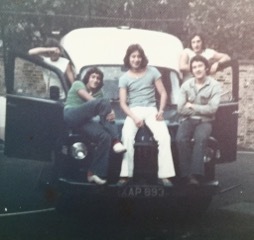 When the band started out, we were called "Junction"we used to practise in the front room at Chris Hudson's place in Beckenham. This obviously didn't last very long for obvious reasons and we were soon sent packing by CH's Mum! Pete Moore's pipe-smoking father (Fred) was a schoolkeeper/caretaker in a school called Nathaniel Heckford School, which was just around the corner from the London College of Furniture in Cable Street in E1, London, where I was studying furniture design and technology. Practice resumed at the school which incidentally is right in the heart of 'Jack The Ripper' territory. Pudding Lane is where Jack took his first blood, just across the road from the College. In fact, an early Junction song called "The Ripper" on 'Ripper Records' was penned about this very subject. We converted an old coal store at the school that had thick brick walls. We draped black curtains around the room and jammed to our hearts and ears content without bothering a soul. We also got a great Sunday lunch courtesy of Peggy (Pete's Mum) who was a dinner lady at another school. She brought home some empty catering-sized baked beans tins for us and being a handy lot, we converted them to build our own lighting rig! 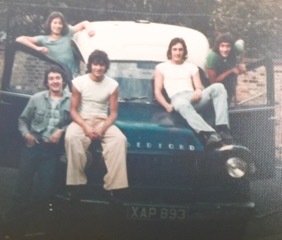 We also built our own PA system and bought ourselves an old Bedford ambulance that kept breaking down on us...!! It was around a year later and after we got a couple of gigs under our belts, we transcended to Praying Mantis. The name change happened purely by accident when we were recording some vocals of Stan's on a song called "Destitute" (you didn't know of that one eh?)! 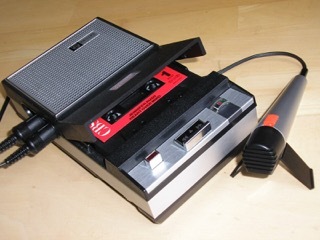 Recording in those days was a very primitive affair utilising 2 Phillips cassette recorders, like the one pictured. The mic stand was a broom with a claw hammer taped to the business end for stability and the condenser microphone (supplied with the recorder) taped to the top of the handle. As you can picture, we were an inventive bunch. We used the 2 recorders to bounce (overdub) the various elements to create a song. It was on one of these sessions while overdubbing that we started gesturing with our hands while singing backing vocals to Stan's melody when he burst out in fits of laughter and said, "You boys look like a load of Praying Mantis's!" The name stuck and "Junction" became history. As our college days grew to a close, Stan was the first to go, moving back up north to Cumbria. During those 3 years at college we had some great times and it was in this period that we met Jeff Crook through Chris Hudson. He managed the band right up until the end of the "Metal For Muthas" tour. He was responsible for putting us into a small 8-Track studio called First Light in Beckenham, South-East London. It was here that we recorded our first proper demos... "Captured City", "Lovers To The Grave", "Johnny Cool" and "The Ripper". Sadly, this was already without Stan, our singer. We played our first gigs as Junction - one being The Magnet and Dewdrop in the heart of the horse shoe that is now the thriving London Docklands. In those days it was a derelict and desolate ghost town! How things have changed! We played this particular gig as a three-piece after Pete dropped the bombshell that he was going to New Zealand on holiday to meet what turned out to be his future 'outlaws'. After a few more shows which included an appearance at The Music Machine (down the road from where I was born), Chris Hudson was the next next to go after meeting a Welsh lass! We recently made contact with Chris again at the launch for "Legacy" at The Borderline. We then acquired a drummer called 'Noddy Collie' (obviously his nickname and whose real name escapes me). He is the son of famous Jazz muso Max Collie (and his Rhythm Aces) Yep, we forgot to include Noddy in The Praying Mantis family tree methinx.... Aaaargh! After Noddy had a horrendous epileptic fit on stage (the crowd thought it was part of the act!!) while supporting Budgie at the Cambridge Corn Exchange, we parted not long after with Noddy's last gig at The Music Machine once more. 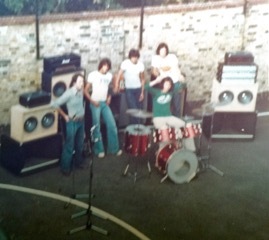 This is when we acquired Mick Ransom on drums. Pete at this point sadly decided to finally part company with the band. He'd met Esther from New Zealand who was living at his parent's house (the school) while studying in the UK. They became more than friends, married and Pete now lives happily in NZ with Esther. We have also recently made contact once more with Pete. 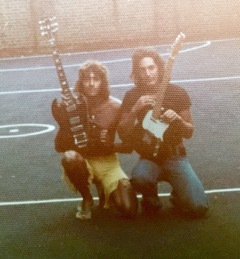 Gracefully and generously, Pete and his parents still allowed us to use the school to rehearse in a new guitarist. Enter Bob Angelo, a charismatic and ebullient character. It was in this period that we started to frequent Neal Kay's Heavy Metal Soundhouse in Kingsbury, London and gave him our original "First Light" demo. He played this to the metal heads who frequented the joint along with contributions by the likes of Iron Maiden and Samson and instantly, we became a hit with the rock clubbers. ... and so the Mantis machine was born!